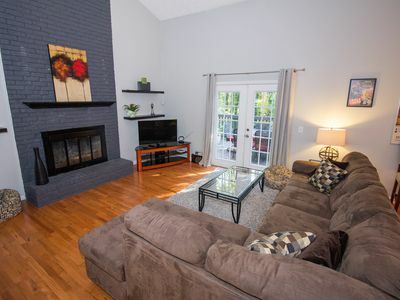 **Please note, that this property is usually rented out for LONG TERM (30+ nights). 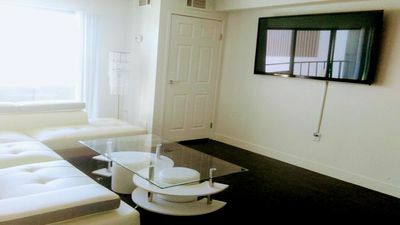 SHORT TERM rental is only available last minute, less than 1 month in advance. 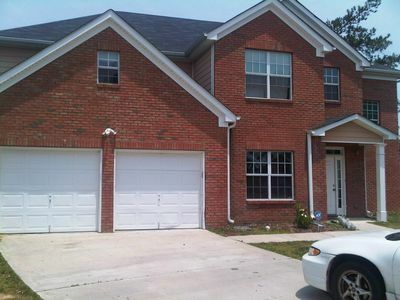 Welcome to the listing of our beautiful Redwine 1 property! 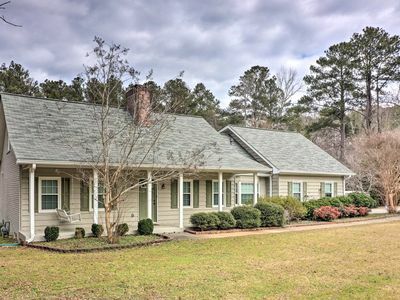 Our Redwine 1 is a spacious, beautiful and fully furnished home, with a lot of privacy tugged away on serene 5 acres, located on a main street in a quiet neighborhood in Fayetteville GA. 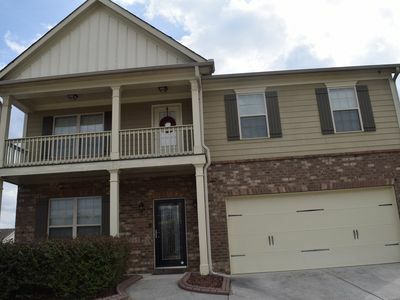 This property is just 6.6 miles (just about 12 minutes) to the Atlanta Pinewood Studios, 34-40 minutes from the Hartsfield-Jackson Atlanta International Airport and only 39-49 minutes south of Downtown and Midtown Atlanta, where you can find the Georgia Aquarium, World of Coca Cola, CNN Center, Georgia World Congress Center, and the Mercedes-Benz Stadium (all Downtown) and experience Atlanta’s finest restaurant and nightlife scene in Midtown. 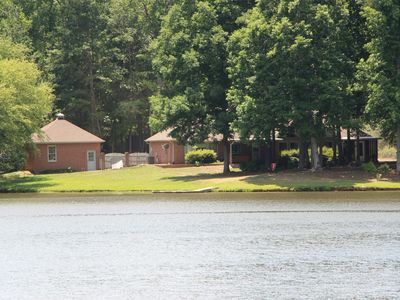 By being close to major highways, many of Atlanta’s attractions are within a short commute away (i.e. Six Flags Over Georgia, Stone Mountain Park, etc.). 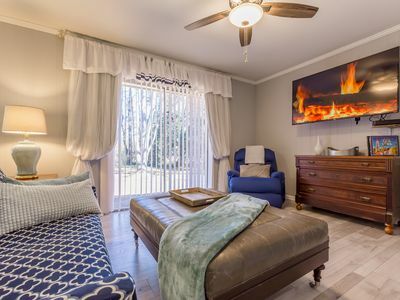 This property is rented out in full but offers two separate living units with separate entrances and accommodations, a total of 5 Bedrooms (5 Beds), 3 Full Bathrooms, 2 Living Rooms, 2 Kitchens, 2 Dining Areas, an Office Area, and a beautiful private backyard including 2 patio areas with outdoor furniture, a BBQ gas grill and a Hot Tub. This property sleeps 10 people. 1. The Main House on the Upper Main Level consists of a Master King Bedroom with full Master Bathroom (combination tub/shower), 2 additional Queen Bedrooms, 1 full Hallway Bathroom (combination tub/shower), a Living Room with TV and fireplace, a large open full Kitchen with stainless-steel appliances, granite counter-tops, a Laundry Closet with washer & dryer, and a large Dining Area with TV off the driveway patio, and LVT floors all throughout. The Main House can sleep up to 6 guests. 2. 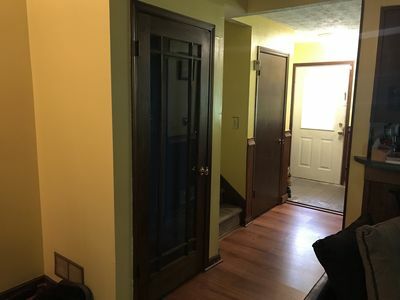 The Guest Suite is located on the Lower Basement Level and has both a separate entrance from the outside, and an internal entrance from the Main Upper Level through a staircase from the Hallway. 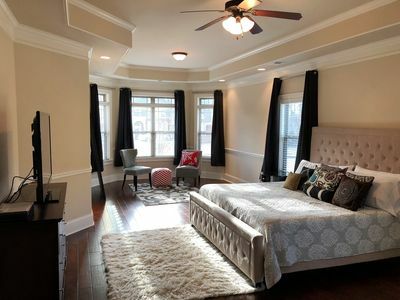 It consists of 2 Queen Bedrooms, 1 full Hallway Bathroom (shower) with a make-up vanity table, an open Living Room with TV, fireplace, a Dining Area, an Office Area (desk, chair, and lamp), and a full-size Kitchen with all black appliances. The Guest Suite can sleep up to 4 guests. 3. 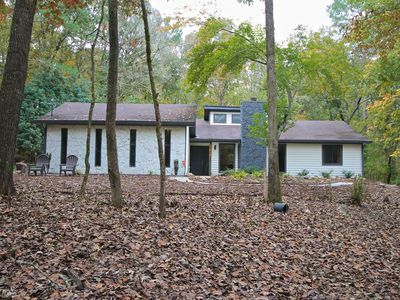 Outside Area features a driveway / patio with entrance to the Main House Kitchen and outdoor furniture with BBQ gas grill. 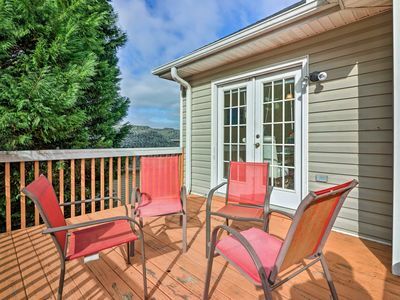 A second small patio with outdoor furniture is located off the Lower Basement Level. 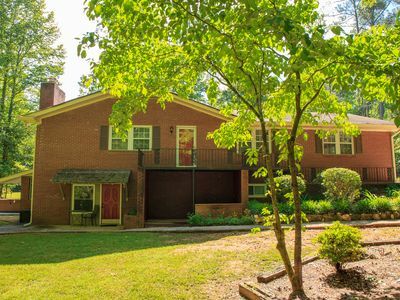 The large private backyard includes a hammock, a firepit (no firewood provided) as well as a beautiful 6-person Hot Tub located off the Lower Basement Level in a totally private setting - perfect for relaxing and open all year long. 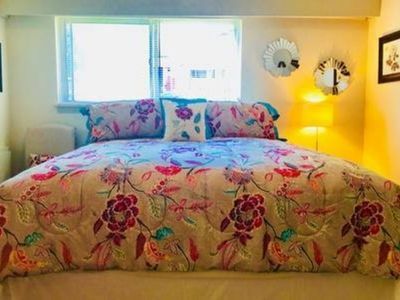 All Bedrooms include comfortable beds with bedding and 1 set of clean linens for each bed, a nightstand, nightstand lamp, dresser and/or closet to store your clothes during your stay. 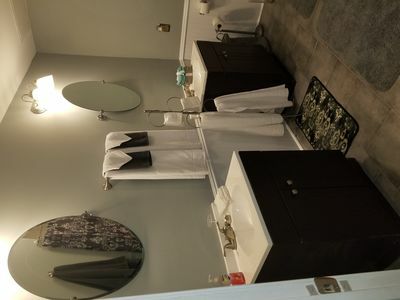 Clean bath towels & wash cloths (1 per guest) as well as hand towels are provided in each bathroom. 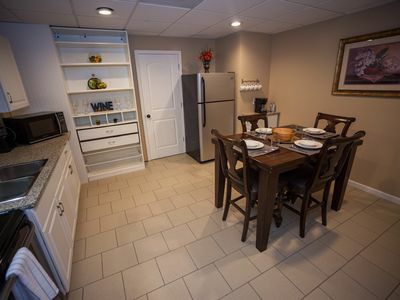 The full Kitchens are equipped with all basic dishware, pots & pans, silverware and utensils. 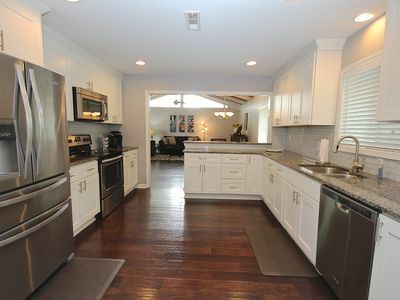 Kitchen appliances include microwave, tea pot, standard electric Coffee Maker, etc. (NO pantry items or condiments included due to Food&Drug Regulations). 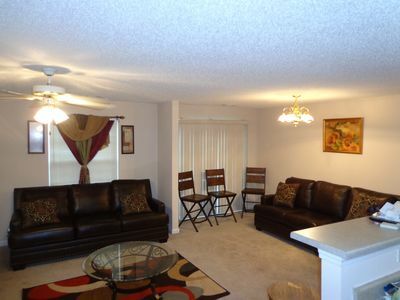 There are comfortable couches, dining table & chairs, and more. 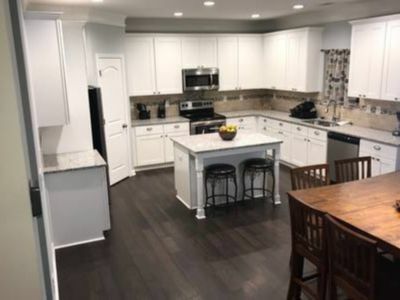 There are 3 flat screen HD TVs with Basic Cable (1 in each Level Living Room + 1 in Upper Main Level Dining/Kitchen Area) as well as 1 DVR, and 1 DVD player at the property. Free Wi-Fi and high-speed internet are provided as well as an office area with desk, office chair and lamp. A washer and dryer are included as well as an iron, ironing board and 1 hair dryer. A LIMITED starter supply of trash liners, dish soap, dishwasher detergent, paper towels, toilet paper, soap, shampoo & body wash, laundry pods, dryer sheets and disinfecting wipes are provided. The BBQ gas grill has a propane tank & BBQ tools provided. The private backyard with its features is perfect for outdoor entertaining. 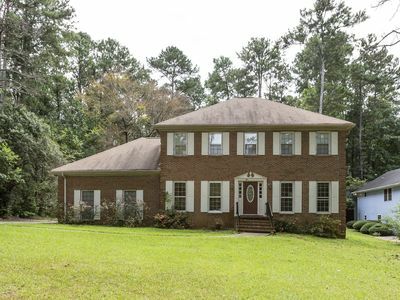 Whether this will be a family vacation, a business trip, or just a convenient home to visit the surrounding area, our Redwine 1 home offers an excellent and comfortable stay in Atlanta. Please inquire with your requested dates in order to receive availability and pricing information. **Please note, that bookings for 30 nights or more require a higher Refundable Damage Deposit of $500 which will be edited in the quote after your inquiry. 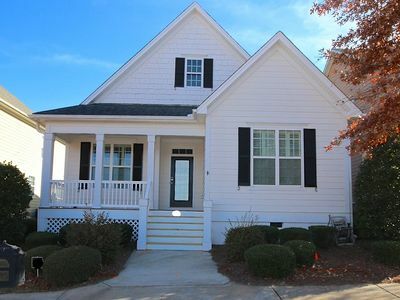 Spacious 3-Level (6 Bdrm) Home with Guest Suite & HotTub near Pinewood Studios! WOW! HBO INCLUDED!! You wont Beat This One! 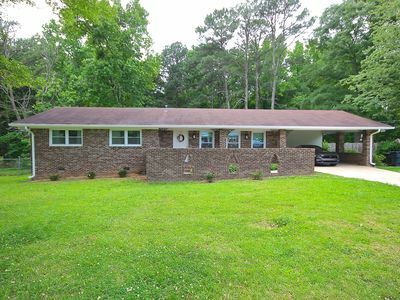 Luxurious Home Near Airport! Peace,simplicity,comfort,and accessible to so much!